MBT: Socks and Sandals | Fashion Do or Don't ??? 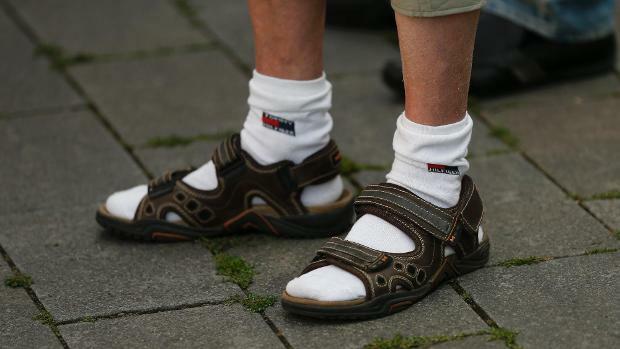 One of THE biggest known Fashion faux-pas has to be wearing socks with sandals, you probably all have the image of a tourist with a loose fitting Hawaii Shirt, Camera hanging around the neck and -the oh so dared- flat black sandals with socks in them, no offence, but it's definitely not runway proof! So how is it possible that a style based on socks and sandals has become so popular amongst the fashion crowd? Fashion today is all about mixing and experimenting with new things, such as combining a classy blazer (which I decorated with an old brooch from my family in Norway) with destroyed jeans and high-heeled sandals with glitter socks. The styles themselves totally contradict each other but together they create a super modern outfit!